Our schools, churches, governments, and mass-media promote a narrative in which economic development and trade lift people out of poverty, open doors to better education, foster better treatment of women, and build co-operation and peace. It is essential to come together to consider alternate narratives -- to question the role of our institutions in promoting and enshrining greed, to ask ourselves if our root belief in human ownership of land, capital, and living beings necessarily leads to wars, unsustainable and toxic resource extraction, labor exploitation, mass extinctions, and ecosystem collapse. These are not new ideas -- throughout civilization, institutionalization and oppression have inspired a rich history of creative resistance. Over time, though, even resistance movements can harden and create new oppressions; systems of power can co-opt the methods and symbols of those who resist. Lao Tsu, in the Tao Te Ching, and Subcomandante Marcos of the Zapatistas both discover methods of recognizing and avoiding this pitfall, arriving at the metaphor of the power of water. Like water, oppressed peoples can take innumerable blows, only to later wash over their oppressors without weapons or bloodshed. Seeking to compare authoritarian philosophies, structures and psychologies to those that are yielding, consensual, communitarian, or autonomous, the workshop includes theater exercises, readings and discussions. Participants compare their own experiences with historical examples of co-optation and institutionalization. 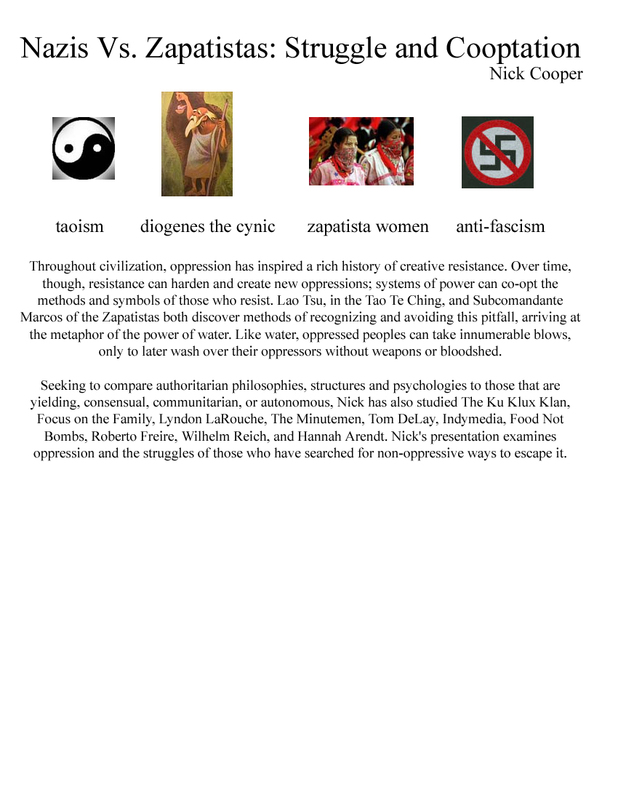 The workshop considers various non-hierarchical currents in history, including Taoism, the Greek cynics, early Christianity, Quakers, Gandhi, Emma Goldman, and the Spanish civil war, Roberto Freire, Wilhelm Reich, Hannah Arendt, and the Zapatistas, as well as brutal and authoritarian currents, including the crusades, fascism, modern far right groups, and the military / industrial complex. Participants leave having explored oppression and the struggles of those who have searched for non-oppressive ways to escape it. Mexico with ILÉ Capoeira Angola, Venezuela at the World Social Forum, Washington DC at the National Conference of Organized Resistance, Edinburg Tx with the Students for Peace and Mecha, Brownsville TX with the One World Club, Houston High Schools (Bellaire, Lamar, KIPP), São Paulo Brazil with the Ativismo ABC Collective (read an interview), Olympia Washington at the Sabot Infoshoppe at Evergreen, Tulsa at the 306 Phoenix House, Sarasota FL with Sarasota Indymedia and VegSarasota, Bryan Tx at Revolution, Houston with The Politically Active Students Organization, Sedition Books, The Houston Social Forum, & the Art Car Klub, Fayetteville at the Five Squirrels, New Orleans at the Iron Rail bookstore, NYC at the The Brecht Forum, & with the Icarus Project, Tallahassee at the Progressive Center, the University of Alabama at Birmingham, Tennessee at The Sequatchie Valley Institute, Pumpkin Hollow & the Tennessee Valley Unitarian Universalist Church, North Carolina at the Blue Heron Farm, Internationalist Books, Virginia at Hampton Roads Indymedia, & Twin Oaks, DC at the Al Fishawy Internet Cafe, Worcester, MA at Collective A Go-Go, NY State at Binghamton Indymedia & Rochester Indymedia, Ohio at the Wire in Athens, Chicago at the ACME art works, Milwaukee at Brewing Grounds for Change, at the crimethinc 2006 gathering, Salt Lake City at the Boing Collective, Spokane and Tacoma WA at houses, Eugene OR at the Jawbreaker, Klamath Falls OR Unitarian Church, San Francisco at Studio40, Berkeley at the Long Haul Infoshop, Cafe Fresno, Sylmar CA at Tia Chucha's, South Central LA at the Southern California Library for Social Studies and Research, LA at Antigua Cultural Coffee House, Santa Ana CA at the Mexican Cultural Center, North Hills CA at Unitarian Universalist Society, Phoenix AZ at the Firehouse, and Tucson AZ at the Dry River.